We still get this question quite often so todays tip is the procedure for adding a signature to emails in Microsoft Outlook 2010. 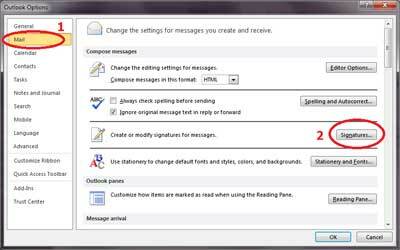 Signatures can be set in Microsoft Outlook 2010 so they don’t need to be typed every time a new mail is sent. 1. In Outlook 2010, click the Office button, and the navigate to Outlook – Options. Click New and select the email account that you want to attach the signature to. Customize the signature with to display the information you wish. 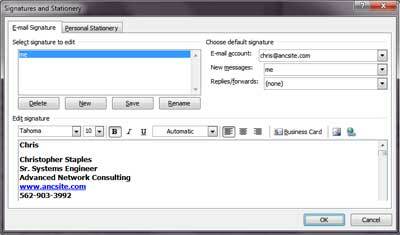 Microsoft Outlook 2010 will new automatically attach this signature to all emails that you create. For businesses in Los Angeles and Orange County in need of network support, remember that Advanced Network Consulting offers same day service, scheduled maintenance appointments, and emergency calls. As an Advanced Network Consulting client, your company’s network security and reliability is our top priority. ANC performs routine maintenance, software updates, hardware installation and upgrades as well as system upgrades as part of your network security. Advanced Network Consulting has been servicing clients throughout Southern California for nearly 20 years. We’ve seen every form of viruses and Spyware out there and our techs are constantly educating themselves on the latest threats and tactics. The Advanced Network Consulting office, strategically located in La Mirada to serve Southeast LA County and North Orange County allows ANC to providesame day appointments, scheduled maintenance and remote access appointments, phone support, and emergency calls are available 7 days a week.